Be Wiser Ducati rider Glenn Irwin. MCE British Superbike rookie Glenn Irwin is facing a ‘damage limitation’ exercise in Monday’ opening race at the Oulton Park Bank Holiday meeting after a clutch issue ruled him out of qualifying on Sunday, held in wet conditions. Irwin, seventh fastest in FP3, was forced to park up his Be Wiser Ducati and will start race one from the back of the grid. “Having the technical problem so early in the session was really frustrating, naturally, as I’d been fast in the dry and fast in the wet, so I was confident of two top ten finishes on race day,” said Irwin. JG Speedfit Kawasaki’s Leon Haslam claimed pole from team-mate James Ellison. Tyco BMW riders Christian Iddon and Michael Laverty were fifth and sixth respectively ahead of Alastair Seeley on the RAF Reserves BMW. Michael Dunlop, riding the Buildbase BMW, was 17th fastest. Race one is scheduled for 1.30pm with race two at 4.30pm. Meanwhile, Andrew Irwin finished an excellent fourth in the British Supersport Sprint race in the wet, with Andy Reid in seventh. Newtownabbey’s Aaron Wright won the first KTM British Junior Cup race. In the National Superstock 1000 class, Taylor Mackenzie topped the times on the Buildbase BMW with Tyco BMW riders Ian Hutchinson and Josh Elliott in third and fifth places on the grid respectively, split by Clogher man Keith Farmer (Quay Garage Honda). 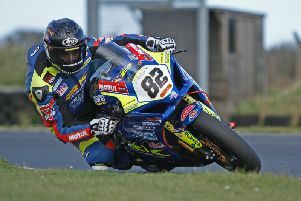 In the Superstock 600 qualifying session, Carl Phillips was third quickest on the Sandown Racing Kawasaki.